Optical data transfer's new leading light? Forget about Wi-Fi - the future of home wireless networking is, according to boffins, the light bulb. So say a number of researchers and technologists who are looking to light to provide the next step in high-speed data networking in the home. The principle is simple: turn a light on and off so rapidly that the human eye can't see the flicker, but a photodetector can nonetheless pick up the stream of 1s and 0s the blinking bulb is transmitting. Compress the data, and you up the throughput even more. 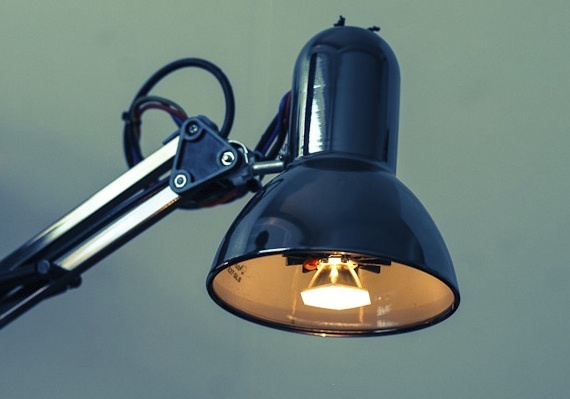 Old-style filament bulbs and fluorescent tubes aren't up to the task, but new, LED-based lighting is. 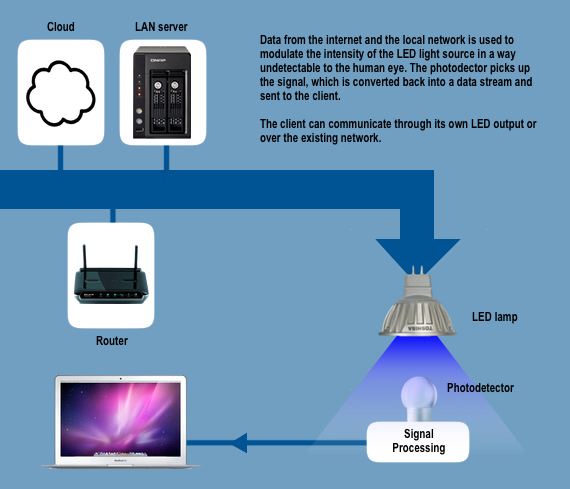 It's not hard to envisage home lighting with an integrated photodetector - to pick up signals sent back from networked devices - and perhaps a powerline adaptor on board to maintain a connection over electrical wiring back to the router. The technique is called Visible Light Communications - or VLC, not to be confused with the open source media player of the same name - but the companies springing up to deliver the technology are already branding it "Li-Fi". The similarity to the name "Wi-Fi" is deliberate: they hope VLC will become as ubiquitous a networking technology as 802.11 has become. One of VLC's key proponents, Harald Haas of the University of Edinburgh, reckons that isn't hyperbole. With tens of billions of regular lightbulbs installed in homes and offices across the globe, as they're replaced with LED light sources, Li-Fi can be a communications technology that can be found almost everywhere. Li-Fi bulbs will inevitably be more costly than regular LED bulbs, but then the potential volumes will, Haas reckons, push prices right down. More to the point, Li-Fi could be used in almost every location where regulations forbid the use of Wi-Fi: aircraft cabins and hospitals, to name but two. And light isn't affected by the spectrum regulations that govern how radio frequencies can be used. Of course, getting it out of the lab and into the living room - and every other space illuminated by a lightbulb - is another matter.